✦ The relationship of creative initiatives to learning and neuroscience are examined in How Creativity Works in the Brain (July 2015), a recently issued 41-page report from the National Endowment for the Arts. Among the report's conclusions: "[C]reativity has implications for human health and well-being as fundamental as the ability to move a limb or recall information." ✦ The 2015 Jerusalem Season of Culture kicked off July 27 with In-House Festival, in which artists and audiences meet in homes in Jerusalem, and continues through September 4. Established in 2010 as a "celebration of creativity", the initiative this year involves more than 3,000 Israeli and some 240 international artists in events at galleries, performance spaces, markets, museums, historic sites, and homes throughout the city. Among the festival components: Jerusalem Sacred Music Festival, August 30 - September 4; Contact Point, at the Israel Museum, August 6; Knock Knock, Prima Royale Hotel, August 10-13; Frontline, off-stream music, August 17-20; and Under the Mountain, a public art festival, beginning August 25. Cutting Silvia's Final Tapestries from the Loom - July 4, 2015 from The Groove Productions on Vimeo. ✦ Textile artist Sue Rangeley creates some of the most beautiful and unique pieces I've seen. She extends her bespoke embroidery, beadwork, silk appliqué, and hand-painting to one-of-a-kind accessories such as purses and embellished belts, clothing (including wedding fashions), pillows, quilts, and painted screens, and framed art. She exhibits internationally and conducts masterclasses. Her most recent book is Embroidered Originals. Read an interview with Sue Rangeley at TextileArtist. ✦ Inspired by fairy tales, nursery rhymes, poetry, and nature, illustrator and printmaker Nick Wonham creates charming multi-colored prints (linocuts) in limited editions. Two books with his illustrations have been published, two more have been completed, and two others are in progress. 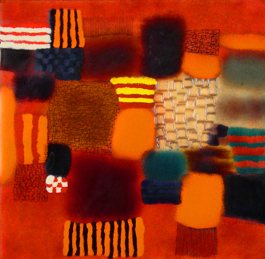 ✦ German textile artist Dagmar Binder hand-makes her felt pieces of fine merino wool and silk. Her work includes fine art objects, theatre costumes, clothing, and fashion accessories. She conducts workshops in Berlin, other European countries, and North and South America. See her wearable art and objects/installations. ✦ Below is an interview with painter Joan Semmel, from Artforum's 500 Words series. Semmel's most recent show was the survey "Across Five Decades" at Alexander Gray Associates in New York City. ✭ Installation artist Liza Lou has created at Wichita Art Museum a shimmering landscape of glass beads that measures 150 square feet. Her Gather (one million) is composed of 9 million beads, varying in their shades of gold, which Lou has threaded onto cut stainless steel wires. Bundled together, the beaded wires look like sheaves of harvested wheat. On the museum walls are other "fields" of glass beads that suggest Kansas skies and sunsets. The installation is on view through September 13. See Kitchen, a beaded installation that took the artist five years to complete. ✭ An outdoor botanical sculpture, the new work Quilt Square (Tulip), and the earthwork Tulips, both by Virginia Poundstone can be seen through October 25 in "Flower Mutations" at The Aldrich Contemporary Art Museum, Ridgefield, Connecticut. 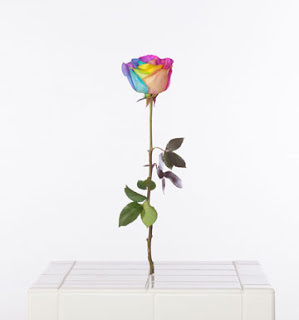 Also on view are a new glass sculpture by Poundstone and her wall print Rainbow Rose (2013), in addition to objects from her personal collection and other artists' works that have inspired Poundstone's own. Read or browse an illustrated eight-page pamphlet (pdf) about the exhibition that includes an interview with the artist and a checklist of artworks on view. The exhibition is part of the museum's Circumstance series that shows how artists "use context to articulate their work." Read more about the series in the news release for the solo exhibition. ✭ Hawaii's Honolulu Museum of Art recently opened "Artists of Hawai'i 2015", presenting work by seven artists (Alison Beste, Elisa Chang, Jesse Houlding, Akira Iha, Emily McIlroy, Lauren Trangmar, and Maile Yawata) and one artist collective (.5ppi). Chosen from among 249 entrants, the artists were given nine months to create work for the biennial exhibition. Included are prints, photography, paintings and drawings, sculpture, and mixed media work. (Click on each of the links above to see the individual artist's contributions. My favorite is Emily McIlroy.) The show continues through October 25. ✭ The centennial celebration "Charlotte Collects Elizabeth Catlett" opened July 18 in Charlotte, North Carolina, at Harvey B. Gantt Center for African-American Arts and Culture. Continuing through December 31, the exhibition to mark the 100th anniversary of the artist's birth includes examples of Catlett's two- and three-dimensional works and photographs from throughout Catlett's life. ✭ The Art Museum at the University of Kentucky at Lexington is presenting "Bottoms Up", a sculpture survey, beginning September 12. On view is the work of such well-known artists as Alexander Calder, Sol LeWitt, Tony Matelli, George Rickey, Lucas Samaras, and Rachel Whiteread. The works range from the figurative to the abstract, the small to the monumental, the personal to the industrial. The show will run through December 20. You'll find me today at Escape Into Life, where I'm delighted to post a new Artist Watch column that spotlights artist Lisa Ann Watkins of the United Kingdom. Lisa specializes in pet portraiture and also paints wildlife. 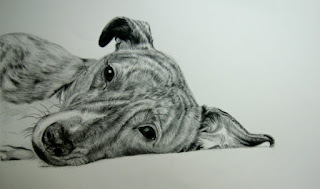 Her portraits of dogs, which are the subject of today's Artist Watch, as well as her images of cats, horses, and tigers and other wildlife, demonstrate Lisa's expert use of graphite, colored pencil, pastel, and watercolor pencil. What I especially appreciate about Lisa's work is how she imbues every portrait with the animal's personality and mood. It's no wonder that her finely detailed, technically skilled, and sensitive work has helped raise funds for animal conservation around the world. Today's Artist Watch feature includes seven of Lisa's wonderful dog portraits, an Artist Statement, and a brief biography, as well as links to Lisa's Website and exhibition galleries. Also see Escape Into Life's related poetry post "Dog Days 2015". Below is a stellar new videopoem from MotionPoems. Watch, then read the text of Catherine Pierce's "The Mother Warns the Tornado". Pierce's wonderful poem captures beautifully the profound, visceral emotions a mother summons to protect her child, even against the ravages of nature. The film was made by Isaac Ravishankara in partnership with VIDA: Women in Literary Arts. Catherine Pierce and Isaac Ravishankara talk with Maggie Roy about the film. Catherine Pierce is the author of the award-winning collection The Girls of Peculiar: Poetry (Saturnalia Books, 2012) and Famous Last Words (Saturnalia, 2008). Her third collection, The Tornado Is the World (Saturnalia), is due out in 2016. Below you'll find a new edition of my occasional series Poets on Poetry, which highlights interviews or feature articles in which poets speak about poetry as vocation, ways that poetry differs from other kinds of writing or from recitation and performance, poetry in translation, and the meaning of poetry in their own and others' lives. Quoted from Michelle Dean, "U.S. Poet Laureate Juan Felipe Herrera: 'Poetry is one of the most beautiful way of participating' | The newly appointed poet laureate of the US talks about his upbringing as a campesino in California, the role of poetry in political life, and Allen Ginsberg", The Guardian, June 16, 2015. Juan Felipe Herrera's has written more than two dozen poetry collections, including, most recently, Senegal Taxi (University of Arizona Press, 2nd Ed., 2013). Quoted from "Interview with Fatimah Asghar", The Blueshift Journal, June 13, 2015. Poet, writer, performer, photographer Fatimah Asghar is the author of the forthcoming chapbook Medusa, They Would Sing (YesYes Books, Fall 2015). She also is co-creator of the "first bi-lingual spoken word poetry group" REFLEKS, a Kundiman Fellow, and a Young Chicago Authors instructor. Marie Howe's poetry collections include The Good Thief (Persea Books, 1988), What the Living Do (W.W. Norton, 1999), and The Kingdom of Ordinary Time (W.W. Norton, 2008). She is co-editor of In the Company of My Solitude: American Writing from the AIDS Pandemic (Persea Books, 1995). Quoted from Ben Lerner, "Diary: On Disliking Poetry", London Review of Books, Vol. 37, No. 12, June 18, 2015. Ben Lerner's most recent poetry collections are Mean Free Path (Copper Canyon Press, 2010) and Angel of Yaw (Copper Canyon Press, 2006). His most recent novel is 10:04 (Faber & Faber, 2014). Elizabeth Austen, Washington State Poet Laureate, 2014-2016, is the author most recently of Full Circle: My Journey Through Infertility and Miscarriage (Westbow Press, April 2015) and Every Dress a Decision (Blue Begonia Press, 2011). Whiting Foundation Award winner Don Mee Choi is the author of the debut collection The Morning News Is Exciting (Action Books, 2010) and the chapbook Petite Manifesto (Vagabond Press, 2014), as well as Freely Frayed,==q, & Race=Nation, part of Wave Books' Wave Pamphlets. Her second collection is the forthcoming Hardly War (Wave Books, April 2016). Also see the interview "The PEN Ten with Don Mee Choi", PEN America, November 25, 2014. Today's short is Avebury, by John Siddique, with music by John's musical alter ego beautifulnoiseskin. The piece was inspired by Derek Jarman's Journey to Avebury (1971) with music by Coil. 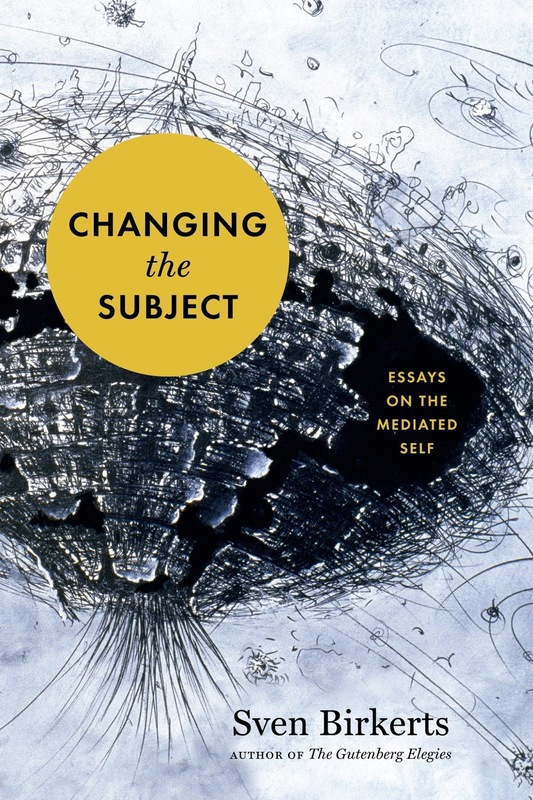 ✦ In October, Graywolf Press will publish critic Sven Birkerts's Changing the Subject: Essays on the Mediated Self. Available to preorder through Amazon, the book examines the relationship of artistic imagination to attention and how digital technologies are affecting how we experience art and read literature. ✦ The beauty created with feathers and a small scalpel is astonishing. Read about Chris Maynard's artistic techniques and browse his feather designs at Featherfolio. Maynard most recently exhibited at Patricia Rovzar Gallery in Seattle, Washington. ✦ Glass sculptor Matei Negreanu, a native of Romania, views glass as "first and foremost the raw material" of his artworks. Never content to rest on his successes, he explores the potential of glass to be transformed. ✦ I first saw an image of Natasha Zeta's promising work at Blue Fifth Review. A graduate of the University of Pittsburgh in studio arts and nonfiction writing, the emerging artist works for Aperture Foundation and for New York Foundation for the Arts' Immigrant Artist Program. In addition to drawing and oil painting, Zeta works in sculpture and photography. See her Tumblr and Behance sites for images. ✦ Leaves, stones, wood, and occasionally crochet as embellishment are the principal materials with which Susanna Bauer works. The German-born artist is exhibiting through August 25 in a group show at Le Salon Vert in Geneva, Switzerland. She'll also be in attendance at October's Affordable Art Fair, Battersea, London. Bauer is represented by Badcocks Gallery, Cornwall, United Kingdom. Read "See Susanna Bauer's Incredibly Delicate Crochet Leaf Sculptures" at Artnet News, June 19, 2015. ✭ An exhibition of William Morris blown-glass and sculpted vessels, "William Morris: Native Species", from the George R. Stroemple Collection continues on view through September 6 at Bergstrom-Mahler Museum of Glass, Neenah, Wisconsin. See selected works at the artist's Website. 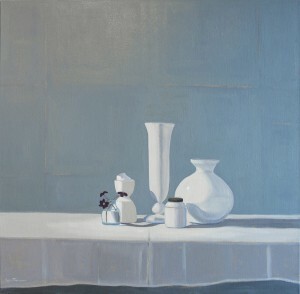 ✭ Still lifes by Carol Thompson are on show through October 4 at Museum of Nebraska Art, University of Nebraska at Kearney. Taking their inspiration from nature, the serene oil paintings feature flowers, birds' nests, branches, and other finds from Thompson's farmstead. ✭ Unique and beautiful examples of contemporary Japanese ceramics from the Carol and Jeffery Horvitz Collection continue on view through April 1, 2016, in "The Resonance of Clay" at Arizona's Phoenix Art Museum. Among the artists whose work is being exhibited are Fukumoto Fuko and Fujikasa Satoko. ✭ Opening August 2 at Fuller Craft Museum, Brockton, Massachusetts, is "Little Dreams in Glass and Metal: Enameling in America, 1920 to the Present". On view through November 29, the first traveling exhibition in more than 50 years to survey the field, "Little Dreams" includes work by 90 artists, among them Kenneth Bates, Karl Drerup, Doris Hall, Edward Winter, Jade Snow Wong, Jamie Bennett, and June Schwarcz. The approximately 120 objects include wearable jewelry and large enamel-on-steel wall panels. Enamel on Copper, Silver Wire, 9" x 9"
Today's column offers a trio of quotes, among many others I've marked, from photographer Sally Mann's memoir Hold Still (Little, Brown, 2015), Nancy Princenthal's biography Agnes Martin: Her Life and Art (Thames & Hudson, 2015), and Annie Cohen-Solal's biography Mark Rothko: Toward the Light in the Chapel (Yale University Press, 2015). I read all three books recently and recommend them to anyone interested in these artists' lives. ✦ ". . . a sense of disappointment and defeat is the essential state of mind for creative work." ~ Agnes Martin, quoted in Agnes Martin (page 258) from Martin's "On the Perfection Underlying Life" in Writings (page 68). ✦ ". . . when we allow snapshots or mediocre photographic portraits to represent us, we find they not only corrupt memory, they also have a troubling power to distort character and mislead posterity." ~ Sally Mann, quoted from Hold Still (page 308). ✦ Mark Rothko ". . . aimed to offer the public not just a painting but also a whole environment, not a simple visit but a true experience, not a fleeting moment but a genuine revelation. This compelled him to innovate. . . ." Annie Cohen-Solal, quoted from "The Long-Awaited Chapel" in Mark Rothko: Toward the Light in the Chapel (page 193). Writer L.B. Gschwandtner recently posted on her Facebook page a Tom Hanks narrated film, Boatlift: An Untold Tale of 9/11 Resilience, about the lower Manhattan evacuation by boat of some 500 million people on 9/11. Produced and directed by Eddie Rosenstein, it is an extraordinary testament to Americans' ability to come together in a crisis. The stirring film, made with support from philanthropist Adrienne Arsht, premiered September 8, 2011, on the tenth anniversary of that horrible day. The "9/11 Tenth Anniversary Summit: Remembrance | Renewal | Resilience" launched a national movement, Road to Resilience, a Website with much to offer. I think it's important to watch this film. To remember. into the purse of their smuggler. upon the old snail's back. I have always been struck by the images of many millions of Syrian refugees carrying their mattresses on their backs as they seek to flee the violence in their country. The English newspaper The Guardian recently featured just such a photo, occasioning this ekphrastic poem. Wyoming's new Poet Laureate is A. Rose Hill, appointed by executive order July 9. She is the seventh person to assume the position, and the third to be named by Governor Matt Mead. Hill succeeds Echo Roy Klaproth, whose term of service began in January 2013. Information about the honorary appointment is contained in my Monday Muse post dated April 26, 2010, which profiles David Romtvedt, the state's fourth official poet. Hill gives many poetry readings and conducts poetry workshops. A. Rose Hill has been a writer since the mid-1970s; however, she has not published a full collection of poetry. Hill received in 2015 an honorable mention in the annual Neltje Blanchan award competition of the Wyoming Arts Council. 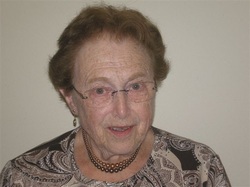 She was named 2012 Wyoming Senior Poet Laureate by California's Amy Kitchener Angels Without Wings Foundation. Hill's poem "Chemo" received honorable mention in the 2008 free verse poetry contest of Wyoming Writers. In addition, Hill was given in 2002 an Emmie Mygatt Award, which is presented to a Wyoming Writers member for outstanding service. ** Quoted from James Chilton, "Sheridan Woman Named Newest Wyoming Poet Laureate", Wyoming Tribune Eagle, July 11, 2015. * The quote is attributed by some to Gene Knudsen Hoffman. Others attribute it to Henry Wadsworth Longfellow. Leah Green of The Compassionate Listening Project cites in her tribute to Hoffman a 2001 letter in which Hoffman wrote that she'd found a motto for the project: it was the title of one of her essays. Read "A January 2002 Interview with Gene Knudsen Hoffman". Today's short is the trailer for the documentary Cyber Seniors. Inspired by two sisters' high school project, the film follows a group of senior citizens (the oldest is 93) who venture onto the Internet with their teen mentors' help. Directed by Saffron Casaday and produced by Brenda Rusnak, the film proves that age need not be an excuse to get connected. 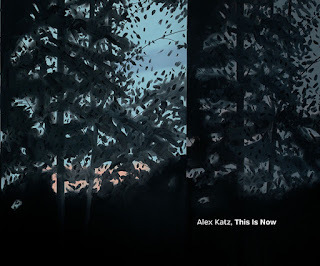 ✦ Forthcoming is Alex Katz, This Is Now (Yale University Press, August 14, 2015), featuring images of work dating to the 1950s and including essays by curator Michael Rooks, art critic Margaret Graham, and artist David Salle, as well as poems by John Godfrey and Vincent Katz, the artist's son who also is an art critic, curator, and translator. The publication, featuring 100 color illustrations, is focused on Katz's landscape paintings and their themes of nature, perception, time's passage, and notions of the sublime. 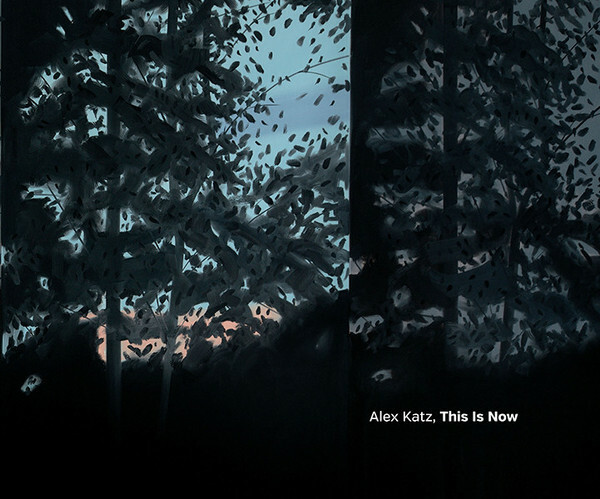 The catalogue accompanies the exhibition "Alex Katz, This Is Now", on view through September 6 at Atlanta's High Museum. ✦ Do you know about W.A.G.E.? That acronym stands for Working Artists and the Greater Economy, a New York-based activist organization founded in 2008 that is "focused on regulating the payment of artist fees by nonprofit art institutions, and establishing a sustainable labor relation between artists and the institutions that subcontract their labor." See the list of institutions currently W.A.G.E.-certified. ✦ The Harry Ransom Center at The University of Texas at Austin now has an open-access policy that it issued recently in conjunction with the launch of "Project REVEAL"; one immediate result is free access to more than 22,000 images of materials in its manuscript collections. The images, which anyone may use for any purpose, without restrictions or fees, are available through the digital collections portal. The center does request that public use of the images include attribution. Read the center's announcement. ✦ You'll want to take more than a single look at the work of mosaic artist Jeanne Opgenhaffen. ✦ Take some time to browse Sonya Clark's Website. Clark, chair of Virginia Commonwealth University's Department of Craft/Material Studies, works with hair, beaded prayers, cloth, combs, and other materials, creating finely made and profound installations and objects. Clark's Three-Fifths (2010) is in "Featured Objects" through July 30 at Bellevue Arts Museum in Washington. ✦ Today's video from Art21 features ceramic sculptor Arlene Shechet, subject of a 20-year survey, "All At Once", at Institute of Contemporary Art Boston through September 7. Shechet talks about her artistic practice and techniques in making cast paper reliefs. ✭ New York City's AFA Gallery opens "Electric Storm" on July 9. The exhibition presents more than 20 functional sculptures by artist and actor Tanya Clarke, who addresses current ecological issues using such materials as steel and hot, hand-sculpted colored glass. The full exhibition is on view through July 23, after which available works may be seen in the showroom through August 30. Visit Clarke's Liquid Light Website. ✭ California's San Jose Museum of Art continues "Jose Clemente Orozco | Figure Studies" through August 23. The exhibition showcases 23 figure studies, many for the first time, loaned by the Michael Wornick Collection. An in-depth presentation is available online: Introduction, Jose Clemente Orozco's Studies in the Michael Wornick Collection, The Collector's Perspective (An Interview), Works in the Exhibition (Slideshow), Related Murals, Biography, and Additional Resources. ✭ On view through August 30 at the Nasher Museum of Art at Duke University is "Colour Correction: British and American Screenprints, 1967-75", drawn primarily from the museum's own print collection. Included are more than 100 works by 40 artists, including Andy Warhol, Eduardo Paolozzi, May Stevens, Richard Anuszkiewicz, William T. Williams, and Liliane Lijn. A slideshow and audio guide are available at the exhibition link. ✭ Continuing through November 15 at Indianapolis Museum of Art is "Michelle Grabner: Weaving Life Into Art", the artist's first solo museum show. Grabner is an abstract painter, installation artist, sculptor, and photographer and also draws and works in video. She's a curator, professor, and critic as well. For this exhibition, the museum is presenting work in all her media, including a monumental installation of her weavings and sculpture; debuting is Grabner's new photographic series inspired by the 2014 season of the Indianapolis Colts. In addition to other events involving the artist, the museum is sponsoring a master class for current BFA and MFA students on October 29. ✭ Opening July 30 at Norton Museum of Art, West Palm Beach, is "The Summer of '68: Photographing the Black Panthers". The exhibition, which will remain on view through October 30, spotlights the important work of photographers Pirkle Jones (1914-2009) and Ruth-Marion Baruch (1922-1997), whose images, given to the museum in 2013, are presented for the first time. Today's column highlights three art-related sites to explore. ✦ Artifex Press ~ Looking for digital catalogues raisonnes? Devoted to the digital publication of catalogues raisonnes, Artifex, launched in 2012 and based in New York City, is offering, for an unspecified period of time, free subscriptions to its compilations of works of Chuck Close (Chuck Close: Paintings 1967 - Present), Jim Dine (Jim Dine: Sculpture 1983 - Present), and Tim Hawkinson (Tim Hawkinson). It plans to produce online catalogues raisonnes on the work of Tara Donovan, Robert Irwin, Agnes Martin, and Richard Tuttle, among other artists. See the Events page for news of panel discussions, demonstrations, and launches. Earlier this week, for example, Artifex presented panel discussions on preparing and publishing digital content and researching artists working in nontraditional media. See the related Catalogue Raisonne Scholars Association. ✦ Art Crit Zingers ~ This site describes itself as "a curated project that invites practicing visual artists . . . to submit the most memorable remarks said to them during studio visits and critiques." The best submissions may be compiled in a future publication. ✦ ARLIS/NA ~ Founded in 1972 by a group of art librarians, the Art Libraries Society of North America collaborates with others arts and information groups to further the goals of art information professionals. Moderated subscriber discussions of arts information issues (e.g., image management) are conducted at ARLIS-L. Among online features are a job listing service, internship opportunities, learning modules, a section that receives and reviews information about new arts publications (including multimedia and technology reviews), research and reports, and art documentation. Also see the section Career Resources. 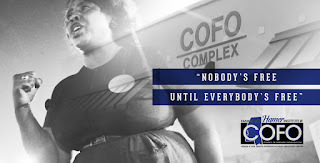 Below is the trailer for the inspiring documentary short This Little Light of Mine: The Legacy of Fannie Lou Hamer (2015), directed by Robin Hamilton. It is being screened today at Metropolitan A.M.E. Church in Washington, D.C., as part of the March on Washington Film Festival, which continues through July 25. Post-screening, a panel discussion is scheduled that will involve Hamer's daughter Vergie Hamer Faulkner, Robin Hamilton, Rep. Eleanor Holmes Norton, who represents the District of Columbia; Rev. Ed King, who founded the Mississippi Democratic Party; Dorie Ladner, an organizer of the Student Non-violent Coordinating Committee (SNCC); and civil rights activist Dr. Leslie McLemore, who created the Hamer Institute @COFO at Jackson State University. The film tells the story of Fannie Lou Hamer (1917-1977), granddaughter of a slave and the youngest of 20 children born to impoverished sharecroppers. During the Civil Rights Movement in America, Hamer brought her leadership to bear on efforts to win African-Americans the right to vote in Mississippi. She challenged the all-White delegation to the 1964 Democratic National Convention in Atlantic City, New Jersey, refused to concede to the compromise proposed, and gave impassioned testimony about her despicable treatment as an activist (she lost her job, suffered a horrific beating in a county jail, and endured death threats and attacks on her family members). She went on to speak out about poverty, founded a land cooperative (Freedom Farms Corporation) for poor farmers, and continued speaking out against discrimination and oppression. By anyone's standards, Fannie Lou Hamer was a remarkable woman. In addition to footage of members of the Mississippi Freedom Democratic Party, which Hamer helped create and organize, the documentary features speeches by the activist and interviews with SNCC members. In making the film, Robin Hamilton restores the voice of Fannie Lou Hamer, endowing her with the importance she deserves in the historic movement to give all African Americans their human rights. Robin Hamilton, making her directorial debut with the film, is the owner of ARoundRobin Production Company. The documentary also is an official selection of the Martha's Vineyard African American Film Festival and will be shown on August 12. Follow the Fannie Lou Hamer - A Film site for news and screenings, as well as blog postings. Several years ago Bill Moyers asked former U.S. Poet Laureate Rita Dove to name poets under 40 whose work she follows. Among the names cited in "Rita Dove's List of Young Poets to Watch" was that of Sandra Beasley, who recently published her third poetry collection, Count the Waves (W.W. Norton, June 2015). Below is Beasley's "I Don't Fear Death" from I Was the Jukebox (W.W. Norton, 2010; Reprint, 2011), awarded the 2009 Barnard Women Poets Prize. Beasley provides the voiceover. Sandra Beasley also is the author of the debut collection Theories of Falling (New Issues Poetry & Prose, 2008), recipient of the 2007 New Issues Poetry Prize (the judge was Marie Howe); and the memoir Don't Kill the Birthday Girl: Tales from an Allergic Life (Broadway Books, Reprint, 2012). Beasley's blog is Chicks Dig Poetry. Reconciliation and healing are two words we hear frequently when tragic events, such as the recent murders at Mother Emanuel in Charleston, South Carolina, threaten peace of mind and deepen an already deep rift among races and cultures. And many of us turn to the arts to reconcile and heal because the arts not only help us to express our identity and make sense of what we are unaware of or do not understand; they also serve to reveal to us our own flawed selves. Claudia Rankine's remarkable Citizen: An American Lyric (Graywolf Press, 2014), for example, is a damning narrative series that shows how entrenched and insidious discrimination is in America; video treatments of African-Americans' experiences exposed in Rankine's widely and deservedly praised prose poems and essays give us much cause to step back and take stock of racism, our contributions to it, and to ask ourselves what responsibility each of us has to identify and overcome our particular biases and to engage in activism leading to positive social change for all. Rankin's book is just one of a number of creative initiatives that take race or ethnicity as their subject and long-term relationship-building as a possible goal. Take a look at the following and consider how you might use your own imaginations, creativity, and leadership abilities to promote frank, open, and honest discussions in your communities, whether physical or online. ✭ The William Winter Institute for Racial Reconciliation at the University of Mississippi has created The Welcome Table, a program that uses small-group retreats and storytelling as the means to improve race relations community-wide. An online program brochure describes a three-part process involving reflection, listening, and relationship-building in partner communities through the sharing of personal stories; education and discernment aimed at uncovering hidden biases and inequities, and understanding their consequences; and training and action to address specific local issues. That process can be duplicated in any community in America. A 15-minute video introduction explains the program and its objectives. A documentary about The Welcome Table is in production. 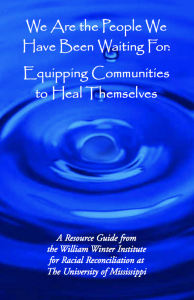 Among a number of excellent resources on the site is the handbook We Are the People We've Been Waiting For: Equipping Communities to Heal Themselves, available online as a pdf. ✭ The Website Love Has No Labels offers a "Hidden Bias Test" and suggests ways to spot and stop bias and prejudice in all its hurtful, divisive forms. 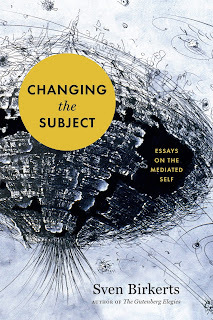 ✭ How do we "transcend the stuff that doesn't lend itself much poetry" in our lives? A conversation in 2011 about a white male poet's use of a black female's body led Claudia Rankine to create "The Open Letter Project", a Web forum that invited writers to share how racial differences affected their artmaking and how art failed to help them "adequately imagine" responses to challenge racism's detrimental effects. Out of that initiative came the collection The Racial Imaginary: Writers on Race in the Life of the Mind (Fence Books, 2015), which was edited by Rankine, Wyoming author Beth Loffreda, and artist Max King Cap; Rankine and Loffreda also contributed the anthology's introduction. Included are letters and essays by more than 40 writers and art by a dozen artists on the issue of racism and its consequences. 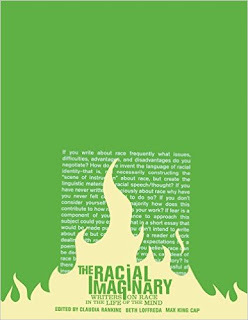 Read poet and essayist Muriel Leung's excellent review of The Racial Imaginary at The Blood-Jet Writing Hour. 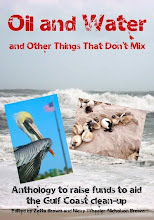 She describes the anthology as a mix of "as many collisions as there are connections" in perspective and concludes that the responses "end so that the dialogue [the book] has started may continue off the page." Communities of co-creators might consider how to use the book to jump-start their own conversations and creative approaches to the issue. Read a one-page summary of how One Drop of Love can be used to educate and promote discussions in schools, churches, and other venues. ✭ Another project co-curated by Fanshen Cox DiGiovanni is Mixed Roots Stories, which, as its title suggests, promotes awareness of "otherness" or "the mixed experience", whether in race, culture, or ethnicity, through the sharing of stories. ✭ Steven F. Riley's non-commercial Website, Mixed Race Studies "provides a gateway to interdisciplinary. . . English language scholarship about the relevant issues surrounding the topic of multiracialism." The term "Arts" is in the long list of categories covered. ✭ The Stronger Together Website features initiatives of organizations in Northern Ireland that work primarily with culturally and linguistically diverse communities to share knowledge and information, provide a shared resource to service providers, and identify opportunities for partnership and innovation in arts and culture, education, health and well-being, and employment. ✭ The grassroots course White People Challenging Racism "seeks to build a racially just society [by] providing the information, skills, and resources needed to spur people to action in standing up against racism." Comprising five weekly two-hour meetings led by pairs of trained facilitators, the workshop is available to adult education programs, college and universities, teachers, law enforcement and other public service agencies, social service groups, and others. A variety of films and videos, books, role-playing, and other resources are used. ✭ The Mixed Remixed Festival brings together writers, artists, musicians, actors and other performers, and filmmakers to celebrate people of all races, creeds, and genders. Members of multi-racial or mixed or blended families may watch live performances, listen to panel discussions, or take part in acting and writing workshops to share or explore their own experiences.